• Hard sponge for reactive and aggressive game play used by most professionals. • Five layered flexible poplar wood blade. • Ergonomic anti-slip flared handle built according to ITTF standards. • Complete package set for 2-4 players. • Set comes with 4 Black/Red sided rackets. • x4 orange three star 40mm ITTF Regulation balls. • x4 white three star 40mm ITTF Regulation balls. • Sleek looking black travel protective case with plastic mold design to hold and organize the balls and rackets in place. • Osleek Guarantee –Item will arrive with all the described parts, without any defects or shipping damage. Money back or instant replacement with no questions asked. Designed for Control and Speed in mind. Comfortable and easy to swing lightweight flared blade designed for long game sessions. 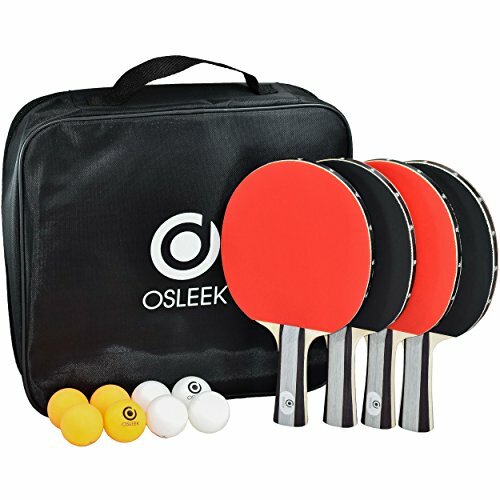 4 paddles and 8 balls portable top quality table tennis protective carry bag with plastic sockets to secure and hold the paddles and balls. Family bundle suitable for 2-4 players. Ideal set for advanced and recreational players. If you have any questions about this product by Osleek, contact us by completing and submitting the form below. If you are looking for a specif part number, please include it with your message.